In the apparel industry, knowing the correct Standard Minute of a product is very important for many reasons. There are mechanisms for determining product SAM other than software, like Work Sampling and Time Study. But time and motion study based calculations took a longer time to establish the standard time for a garment. Secondly, there is always a question of getting correct SAM established by Time Study and operator performance rating. To get rid of these issues leading garment manufacturers are adopting SAM calculation Software. With quick Standard Minute establishing, most of these software products help in calculating direct labor cost and CMT price; setting up standard sewing methods and improve production methods. In this post, I will share leading SAM calculation software products. All the following products are developed from Methods Time Measurement (MTM) and known as PMTS database. GSD is the most popular and globally accepted product for work measurement and setting up standard time for garment sewing operations (machine operations and manual operations). SewEasy is developed by Sri Lanka based company SewEasy. 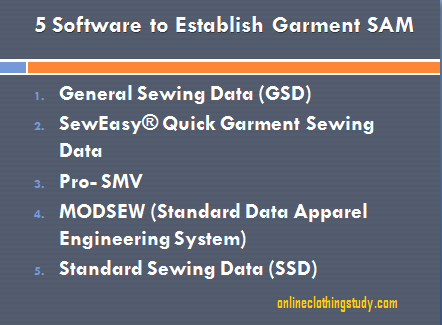 SewEasy® Quick Garment Sewing Data system is used for estimating the Standard Minute Value (SMV, SAM), a measure of labor content of garments, home furnishing, lingerie, leather goods and all sewn products. Read more about SewEasy. Pro-SMV is the tool to establish Standard Time and Best Methods of sewing operations. This product is developed by Methods Workshop Apparel Consultancy. Read more about Pro-SMV. MODSEW is a computerized adaptation of MODAPTS, or MODular Arrangement of Predetermined Time Standards. MODAPTS is used for calculating reliable production standards, improving an organization's productivity, analyzing departmental efficiency, and improving employee relations. Read more about MODSEW and MODAPTS. SSD is developed by AJ Consultants. Standard Sewing Data (SSD) system suits to all sewing rooms from light to heavy – from underwear to upholstery. With the universal Standard Work Data extension, the system suits to all manual and tool-assisted operations in a garment factory. SSD standard data and methods development program is for creating accurate time standards fast – and in advance – for labor costing, production planning and work loading and incentive and piece rate systems and for continuous methods development and efficient job training. SSD is fast and easy to learn and to use. Garment SAM calculation Software solutions. These software helps users to establish garment standard minutes, standard labor cost and improve sewing method.